Much ado over Bingo or his imposter? GUEST BLOG / Short fiction by F. ANSTEY, 1892--I have set myself the task of relating in the course of this story, without suppressing or altering a single detail, the most painful and humiliating episode in my life. I do this, not because it will give me the least pleasure, but simply because it affords me an opportunity of extenuating myself which has hitherto been wholly denied to me. As a general rule I am quite aware that to publish a lengthy explanation of one's conduct in any questionable transaction is not the best means of recovering a lost reputation; but in my own case there is one to whom I shall never more be permitted to justify myself by word of mouth—even if I found myself able to attempt it. And as she could not possibly think worse of me than she does at present, I write this, knowing it can do me no harm, and faintly hoping that it may come to her notice and suggest a doubt whether I am quite so unscrupulous a villain, so consummate a hypocrite, as I have been forced to appear in her eyes. The bare chance of such a result makes me perfectly indifferent to all else: I cheerfully expose to the derision of the whole reading world the story of my weakness and my shame, since by doing so I may possibly rehabilitate myself somewhat in the good opinion of one person. 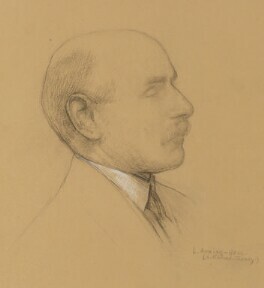 Thomas Anstey Guthrie (1856 - 1934) was an English novelist and journalist, who wrote his comic novels under the pseudonym F. Anstey. My name is Algernon Weatherhead, and I may add that I am in one of the Government departments; that I am an only son, and live at home with my mother. We had had a house at Hammersmith until just before the period covered by this history, when, our lease expiring, my mother decided that my health required country air at the close of the day, and so we took a 'desirable villa residence' on one of the many new building estates which have lately sprung up in such profusion in the home counties. 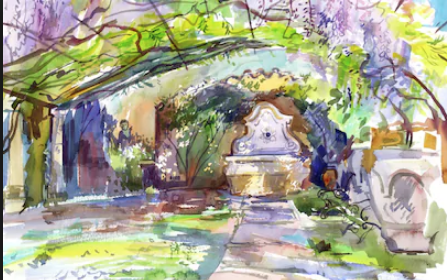 We have called it 'Wistaria Villa.' It is a pretty little place, the last of a row of detached villas, each with its tiny rustic carriage gate and gravel sweep in front, and lawn enough for a tennis court behind, which lines the road leading over the hill to the railway station. I could certainly have wished that our landlord, shortly after giving us the agreement, could have found some other place to hang himself in than one of our attics, for the consequence was that a housemaid left us in violent hysterics about every two months, having learnt the tragedy from the tradespeople, and naturally 'seen a somethink' immediately afterwards. Still it is a pleasant house, and I can now almost forgive the landlord for what I shall always consider an act of gross selfishness on his part. In the country, even so near town, a next-door neighbour is something more than a mere numeral; he is a possible acquaintance, who will at least consider a newcomer as worth the experiment of a call. I soon knew that 'Shuturgarden,' the next house to our own, was occupied by a Colonel Currie, a retired Indian officer; and often, as across the low boundary wall I caught a glimpse of a graceful girlish figure flitting about amongst the rose-bushes in the neighbouring garden, I would lose myself in pleasant anticipations of a time not far distant when the wall which separated us would be (metaphorically) levelled. I remember—ah, how vividly!—the thrill of excitement with which I heard from my mother on returning from town one evening that the Curries had called, and seemed disposed to be all that was neighbourly and kind. I remember, too, the Sunday afternoon on which I returned their call—alone, as my mother had already done so during the week. I was standing on the steps of the Colonel's villa waiting for the door to open when I was startled by a furious snarling and yapping behind, and, looking round, discovered a large poodle in the act of making for my legs. 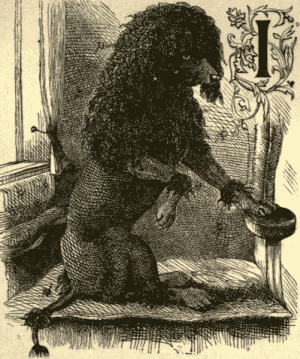 He was a coal-black poodle, with half of his right ear gone, and absurd little thick moustaches at the end of his nose; he was shaved in the sham-lion fashion, which is considered, for some mysterious reason, to improve a poodle, but the barber had left sundry little tufts of hair which studded his haunches capriciously. I could not help being reminded, as I looked at him, of another black poodle which Faust entertained for a short time, with unhappy results, and I thought that a very moderate degree of incantation would be enough to bring the fiend out of this brute. He made me intensely uncomfortable, for I am of a slightly nervous temperament, with a constitutional horror of dogs and a liability to attacks of diffidence on performing the ordinary social rites under the most favourable conditions, and certainly the consciousness that a strange and apparently savage dog was engaged in worrying the heels of my boots was the reverse of reassuring. The Currie family received me with all possible kindness: 'So charmed to make your acquaintance, Mr. Weatherhead,' said Mrs. Currie, as I shook hands. 'I see,' she added pleasantly, 'you've brought the doggie in with you.' As a matter of fact, I had brought the doggie in at the ends of my coat-tails, but it was evidently no unusual occurrence for visitors to appear in this undignified manner, for she detached him quite as a matter of course, and, as soon as I was sufficiently collected, we fell into conversation. I discovered that the Colonel and his wife were childless, and the slender willowy figure I had seen across the garden wall was that of Lilian Roseblade, their niece and adopted daughter. She came into the room shortly afterwards, and I felt, as I went through the form of an introduction, that her sweet fresh face, shaded by soft masses of dusky brown hair, more than justified all the dreamy hopes and fancies with which I had looked forward to that moment. She talked to me in a pretty, confidential, appealing way, which I have heard her dearest friends censure as childish and affected, but I thought then that her manner had an indescribable charm and fascination about it, and the memory of it makes my heart ache now with a pang that is not all pain. Even before the Colonel made his appearance I had begun to see that my enemy, the poodle, occupied an exceptional position in that household. It was abundantly clear by the time I took my leave. He seemed to be the centre of their domestic system, and even lovely Lilian revolved contentedly around him as a kind of satellite; he could do no wrong in his owner's eyes, his prejudices (and he was a narrow-minded animal) were rigorously respected, and all domestic arrangements were made with a primary view to his convenience. I may be wrong, but I cannot think that it is wise to put any poodle upon such a pedestal as that. How this one in particular, as ordinary a quadruped as ever breathed, had contrived to impose thus upon his infatuated proprietors, I never could understand, but so it was—he even engrossed the chief part of the conversation, which after any lull seemed to veer round to him by a sort of natural law. I had to endure a long biographical sketch of him—what a Society paper would call an 'anecdotal photo'—and each fresh anecdote seemed to me to exhibit the depraved malignity of the beast in a more glaring light, and render the doting admiration of the family more astounding than ever. I agreed with an inward shudder that it was very deep, thinking privately that, if this was a specimen of Bingo's usual treatment of the natives, it would be odd if he did not find himself deeper still before—probably just before—he died. Such were the stories of that abandoned dog's blunderheaded ferocity to which I was forced to listen, while all the time the brute sat opposite me on the hearthrug, blinking at me from under his shaggy mane with his evil bleared eyes, and deliberating where he would have me when I rose to go. This was the beginning of an intimacy which soon displaced all ceremony. It was very pleasant to go in there after dinner, even to sit with the Colonel over his claret and hear more stories about Bingo, for afterwards I could go into the pretty drawing-room and take my tea from Lilian's hands, and listen while she played Schubert to us in the summer twilight. The poodle was always in the way, to be sure, but even his ugly black head seemed to lose some of its ugliness and ferocity when Lilian laid her pretty hand on it. On the whole I think that the Currie family were well disposed towards me; the Colonel considering me as a harmless specimen of the average eligible young man—which I certainly was—and Mrs. Currie showing me favour for my mother's sake, for whom she had taken a strong liking. As for Lilian, I believed I saw that she soon suspected the state of my feelings towards her and was not displeased by it. I looked forward with some hopefulness to a day when I could declare myself with no fear of a repulse. But it was a serious obstacle in my path that I could not secure Bingo's good opinion on any terms. The family would often lament this pathetically themselves. 'You see,' Mrs. Currie would observe in apology, 'Bingo is a dog that does not attach himself easily to strangers'—though for that matter I thought he was unpleasantly ready to attach himself to me. I did try hard to conciliate him. I brought him propitiatory buns—which was weak and ineffectual, as he ate them with avidity, and hated me as bitterly as ever, for he had conceived from the first a profound contempt for me and a distrust which no blandishments of mine could remove. Looking back now, I am inclined to think it was a prophetic instinct that warned him of what was to come upon him through my instrumentality. Only his approbation was wanting to establish for me a firm footing with the Curries, and perhaps determine Lilian's wavering heart in my direction; but, though I wooed that inflexible poodle with an assiduity I blush to remember, he remained obstinately firm. Still, day by day, Lilian's treatment of me was more encouraging; day by day I gained in the esteem of her uncle and aunt; I began to hope that soon I should be able to disregard canine influence altogether. Now there was one inconvenience about our villa (besides its flavour of suicide) which it is necessary to mention here. By common consent all the cats of the neighbourhood had selected our garden for their evening reunions. I fancy that a tortoiseshell kitchen cat of ours must have been a sort of leader of local feline society—I know she was 'at home,' with music and recitations, on most evenings. My poor mother found this interfered with her after-dinner nap, and no wonder, for if a cohort of ghosts had been 'shrieking and squealing,' as Calpurnia puts it, in our back garden, or it had been fitted up as a crèche for a nursery of goblin infants in the agonies of teething, the noise could not possibly have been more unearthly. We sought for some means of getting rid of the nuisance: there was poison of course, but we thought it would have an invidious appearance, and even lead to legal difficulties, if each dawn were to discover an assortment of cats expiring in hideous convulsions in various parts of the same garden. Firearms, too, were open to objection, and would scarcely assist my mother's slumbers, so for some time we were at a loss for a remedy. At last, one day, walking down the Strand, I chanced to see (in an evil hour) what struck me as the very thing—it was an air-gun of superior construction displayed in a gunsmith's window. I went in at once, purchased it, and took it home in triumph; it would be noiseless, and would reduce the local average of cats without scandal—one or two examples, and feline fashion would soon migrate to a more secluded spot. I lost no time in putting this to the proof. That same evening I lay in wait after dusk at the study window, protecting my mother's repose. As soon as I heard the long-drawn wail, the preliminary sputter, and the wild stampede that followed, I let fly in the direction of the sound. I suppose I must have something of the national sporting instinct in me, for my blood was tingling with excitement; but the feline constitution assimilates lead without serious inconvenience, and I began to fear that no trophy would remain to bear witness to my marksmanship. But all at once I made out a dark indistinct form slinking in from behind the bushes. I waited till it crossed a belt of light which streamed from the back kitchen below me, and then I took careful aim and pulled the trigger. This time at least I had not failed—there was a smothered yell, a rustle—and then silence again. I ran out with the calm pride of a successful revenge to bring in the body of my victim, and I found underneath a laurel, no predatory tom-cat, but (as the discerning reader will no doubt have foreseen long since) the quivering carcase of the Colonel's black poodle! I intend to set down here the exact unvarnished truth, and I confess that at first, when I knew what I had done, I was not sorry. I was quite innocent of any intention of doing it, but I felt no regret. I even laughed—madman that I was—at the thought that there was the end of Bingo at all events; that impediment was removed, my weary task of conciliation was over for ever! But soon the reaction came; I realised the tremendous nature of my deed, and shuddered. I had done that which might banish me from Lilian's side for ever! All unwittingly I had slaughtered a kind of sacred beast, the animal around which the Currie household had wreathed their choicest affections! How was I to break it to them? Should I send Bingo in with a card tied to his neck and my regrets and compliments? That was too much like a present of game. Ought I not to carry him in myself? I would wreathe him in the best crape, I would put on black for him—the Curries would hardly consider a taper and a white sheet, or sackcloth and ashes, an excessive form of atonement—but I could not grovel to quite such an abject extent. I wondered what the Colonel would say. Simple and hearty as a general rule, he had a hot temper on occasions, and it made me ill as I thought, would he and, worse still, would Lilian believe it was really an accident? They knew what an interest I had in[ silencing the deceased poodle—would they believe the simple truth? I vowed that they should believe me. My genuine remorse and the absence of all concealment on my part would speak powerfully for me. I would choose a favourable time for my confession; that very evening I would tell all. Still I shrank from the duty before me, and as I knelt down sorrowfully by the dead form and respectfully composed his stiffening limbs, I thought that it was unjust of Fate to place a well-meaning man, whose nerves were not of iron, in such a position. Then, to my horror, I heard a well-known ringing tramp on the road outside, and smelt the peculiar fragrance of a Burmese cheroot. It was the Colonel himself, who had been taking out the doomed Bingo for his usual evening run. I don't know how it was exactly, but a sudden panic came over me. I held my breath, and tried to crouch down unseen behind the laurels; but he had seen me, and came over at once to speak to me across the hedge. He stood there, not two yards from his favourite's body! Fortunately it was unusually dark that evening. 'Ha, there you are, eh?' he began heartily; 'don't rise, my boy, don't rise.' I was trying to put myself in front of the poodle, and did not rise—at least, only my hair did. I could not tell him that I was laying out his poodle! My voice shook as, with a guilty confusion that was veiled by the dusk, I said it was a fine evening—which it was not. But I couldn't. I could have told him at my own time, in a prepared form of words—but not then. I felt I must use all my wits to gain time and fence with the questions. 'Well,' said the Colonel, 'I'll go and fasten him up before he's off again. How your teeth are chattering—you've caught a chill, man—go indoors at once and, if you feel equal to it, look in half an hour later about grog time, and I'll tell you all about it. Compliments to your mother. Don't forget—about grog time!' I had got rid of him at last, and I wiped my forehead, gasping with relief. I would go round in half an hour, and then I should be prepared to make my melancholy announcement. For, even then, I never thought of any other course, until suddenly it flashed upon me with terrible clearness that my miserable shuffling by the hedge had made it impossible to tell the truth! I had not told a direct lie, to be sure, but then I had given the Colonel the impression that I had denied having seen the dog. Many people can appease their consciences by reflecting that, whatever may be the effect their words produce, they did contrive to steer clear of a downright lie. I never quite knew where the distinction lay, morally, but there is that feeling—I have it myself. Unfortunately, prevarication has this drawback, that, if ever the truth comes to light, the prevaricator is in just the same case as if he had lied to the most shameless extent, and for a man to point out that the words he used contained no absolute falsehood will seldom restore confidence. I might of course still tell the Colonel of my misfortune, and leave him to infer that it had happened after our interview, but the poodle was fast becoming cold and stiff, and they would most probably suspect the real time of the occurrence. And then Lilian would hear that I had told a string of falsehoods to her uncle over the dead body of their idolised Bingo—an act, no doubt, of abominable desecration, of unspeakable profanity in her eyes! If it would have been difficult before to prevail on her to accept a bloodstained hand, it would be impossible after that. No, I had burnt my ships, I was cut off for ever from the straightforward course; that one moment of indecision had decided my conduct in spite of me—I must go on with it now and keep up the deception at all hazards. It was bitter. I had always tried to preserve as many of the moral principles which had been instilled into me as can be conveniently retained in this grasping world, and it had been my pride that, roughly speaking, I had never been guilty of an unmistakable falsehood. But henceforth, if I meant to win Lilian, that boast must be relinquished for ever! I should have to lie now with all my might, without limit or scruple, to dissemble incessantly, and 'wear a mask,' as the poet Bunn beautifully expressed it long ago, 'over my hollow heart.' I felt all this keenly—I did not think it was right—but what was I to do? After thinking all this out very carefully, I decided that my only course was to bury the poor animal where he fell and say nothing about it. With some vague idea of precaution I first took off the silver collar he wore, and then hastily interred him with a garden-trowel and succeeded in removing all traces of the disaster. I fancy I felt a certain relief in the knowledge that there would now be no necessity to tell my pitiful story and risk the loss of my neighbours' esteem. By-and-by, I thought, I would plant a rose-tree over his remains, and some day, as Lilian and I, in the noontide of our domestic bliss, stood before it admiring its creamy luxuriance, I might (perhaps) find courage to confess that the tree owed some of that luxuriance to the long-lost Bingo. There was a touch of poetry in this idea that lightened my gloom for the moment. I need scarcely say that I did not go round to Shuturgarden that evening. I was not hardened enough for that yet—my manner might betray me, and so I very prudently stayed at home. But that night my sleep was broken by frightful dreams. I was perpetually trying to bury a great gaunt poodle, which would persist in rising up through the damp mould as fast as I covered him up.... Lilian and I were engaged, and we were in church together on Sunday, and the poodle, resisting all attempts to eject him, forbade our banns with sepulchral barks.... It was our wedding-day, and at the critical moment the poodle leaped between us and swallowed the ring.... Or we were at the wedding-breakfast, and Bingo, a grizzly black skeleton with flaming eyes, sat on the cake and would not allow Lilian to cut it. Even the rose-tree fancy was reproduced in a distorted form—the tree grew, and every blossom contained a miniature Bingo, which barked; and as I woke I was desperately trying to persuade the Colonel that they were ordinary dog-roses. I went up to the office next day with my gloomy secret gnawing my bosom, and, whatever I did, the spectre of the murdered poodle rose before me. For two days after that I dared not go near the Curries, until at last one evening after dinner I forced myself to call, feeling that it was really not safe to keep away any longer. My conscience smote me as I went in. I put on an unconscious easy manner, which was such a dismal failure that it was lucky for me that they were too much engrossed to notice it. I never before saw a family so stricken down by a domestic misfortune as the group I found in the drawing-room, making a dejected pretence of reading or working. We talked at first—and hollow talk it was—on indifferent subjects, till I could bear it no longer, and plunged boldly into danger. 'I don't see the dog,' I began. 'I suppose you—you found him all right the other evening, Colonel?' I wondered as I spoke whether they would not notice the break in my voice, but they did not. 'Gone, Mr. Weatherhead; gone without a word!' said Mrs. Currie, plaintively, as if she thought the dog might at least have left an address. I said—Heaven forgive me!—that I thought it highly improbable. It will be easily understood what torture conversations like these were to me, and how I hated myself as I sympathised and spoke encouraging words concerning the dog's recovery, when I knew all the time he was lying hid under my garden mould. But I took it as a part of my punishment, and bore it all uncomplainingly; practice even made me an adept in the art of consolation—I believe I really was a great comfort to them. I had hoped that they would soon get over the first bitterness of their loss, and that Bingo would be first replaced and then forgotten in the usual way; but there seemed no signs of this coming to pass. The poor Colonel was too plainly fretting himself ill about it; he went pottering about forlornly— advertising, searching, and seeing people, but all of course to no purpose, and it told upon him. He was more like a man whose only son and heir had been stolen, than an Anglo-Indian officer who had lost a poodle. I had to affect the liveliest interest in all his inquiries and expeditions, and to listen to, and echo, the most extravagant eulogies of the departed, and the wear and tear of so much duplicity made me at last almost as ill as the Colonel himself. I could not help seeing that Lilian was not nearly so much impressed by my elaborate concern as her relatives; and sometimes I detected an incredulous look in her frank brown eyes that made me very uneasy. Little by little, a rift widened between us, until at last in despair I determined to know the worst before the time came when it would be hopeless to speak at all. I chose a Sunday evening as we were walking across the green from church in the golden dusk, and then I ventured to speak to her of my love. She heard me to the end, and was evidently very much agitated. At last she murmured that it could not be, unless—no, it never could be now. I started back overwhelmed. Did she know all? If not, how much did she suspect? I must find out that at once! 'What about Bingo?' I managed to pronounce, with a dry tongue. I was relieved to find it was no worse than this. 'What do you mean, Lilian?' I said hoarsely. 'How could I find him?' Again I feared the worst. Lilian had never been so childishly unreasonable as this before, and yet I loved her more madly than ever; but I did not like this allusion to Travers, a rising barrister, who lived with his sister in a pretty cottage near the station, and had shown symptoms of being attracted by Lilian. He was away on circuit just then, luckily, but at least even he would have found it a hard task to find Bingo—there was comfort in that. 'Bub—bub—bring back Bingo!' she said. It was of no use to argue with her; I knew Lilian by that time. With her pretty caressing manner she united a latent obstinacy which it was hopeless to attempt to shake. I feared, too, that she was not quite certain as yet whether she cared for me or not, and that this condition of hers was an expedient to gain time. I left her with a heavy heart. Unless I proved my worth by bringing back Bingo within a very short time, Travers would probably have everything his own way. And Bingo was dead! However, I took heart. I thought that perhaps if I could succeed by my earnest efforts in persuading Lilian that I really was doing all in my power to recover the poodle, she might relent in time, and dispense with his actual production. So, partly with this object, and partly to appease the remorse which now revived and stung me deeper than before, I undertook long and weary pilgrimages after office hours. I spent many pounds in advertisements; I interviewed dogs of every size, colour, and breed, and of course I took care to keep Lilian informed of each successive failure. But still her heart was not touched; she was firm. If I went on like that, she told me, I was certain to find Bingo one day—then, but not before, would her doubts be set at rest. I was walking one day through the somewhat squalid district which lies between Bow Street and High Holborn, when I saw, in a small theatrical costumier's window, a handbill stating that a black poodle had 'followed a gentleman' on a certain date, and if not claimed and the finder remunerated before a stated time, would be sold to pay expenses. I went in and got a copy of the bill to show Lilian, and although by that time I scarcely dared to look a poodle in the face, I thought I would go to the address given and see the animal, simply to be able to tell Lilian I had done so. And out of the tub there crawled slowly, with a snuffling whimper and a rattling of its chain, the identical dog I had slain a few evenings before! At least, so I thought for a moment, and felt as if I had seen a spectre; the resemblance was so exact—in size, in every detail, even to the little clumps of hair about the hind parts, even to the lop of half an ear, this dog might have been the 'doppel-gänger' of the deceased Bingo. I suppose, after all, one black poodle is very like any other black poodle of the same size, but the likeness startled me. I think it was then that the idea occurred to me that here was a miraculous chance of securing the sweetest girl in the whole world, and at the same time atoning for my wrong by bringing back gladness with me to Shuturgarden. It only needed a little boldness; one last deception, and I could embrace truthfulness once more. 'He don't seem to be a puttin' of 'isself out about seeing you again,' observed Mr. Blagg, as the poodle studied me with a calm interest. I wanted to get the hateful business over as soon as possible. I did not care what I paid—Lilian was worth all the expense! I said I had no doubt myself as to the real ownership of the animal, but I would give him any sum in reason, and would remove the dog at once. And so we settled it. I paid him an extortionate sum, and came away with a duplicate poodle, a canine counterfeit which I hoped to pass off at Shuturgarden as the long-lost Bingo. I know it was wrong—it even came unpleasantly near dog-stealing—but I was a desperate man. I saw Lilian gradually slipping away from me, I knew that nothing short of this could ever recall her, I was sorely tempted, I had gone far on the same road already, it was the old story of being hung for a sheep. And so I fell. Surely some who read this will be generous enough to consider the peculiar state of the case, and mingle a little pity with their contempt. I was dining in town that evening and took my purchase home by a late train; his demeanour was grave and intensely respectable; he was not the animal to commit himself by any flagrant indiscretion—he was gentle and tractable, too, and in all respects an agreeable contrast in character to the original. Still, it may have been the after-dinner workings of conscience, but I could not help fancying that I saw a certain look in the creature's eyes, as if he were aware that he was required to connive at a fraud, and rather resented it. If he would only be good enough to back me up! Fortunately, however, he was such a perfect facsimile of the outward Bingo, that the risk of detection was really inconsiderable. When I got him home, I put Bingo's silver collar round his neck—congratulating myself on my forethought in preserving it, and took him in to see my mother. She accepted him as what he seemed, without the slightest misgiving; but this, though it encouraged me to go on, was not decisive, the spurious poodle would have to encounter the scrutiny of those who knew every tuft on the genuine animal's body! Nothing would have induced me to undergo such an ordeal as that of personally restoring him to the Curries. We gave him supper, and tied him up on the lawn, where he howled dolefully all night, and buried bones. The next morning I wrote a note to Mrs. Currie, expressing my pleasure at being able to restore the lost one, and another to Lilian, containing only the words, 'Will you believe now that I am sincere?' Then I tied both round the poodle's neck and dropped him over the wall into the Colonel's garden just before I started to catch my train to town. I drew a deep breath of relief. I had played a desperate game—but I had won! I could have wished, to be sure, that my mother had not thought of bringing in Travers on that of all evenings—but I hoped that I could defy him after this. The Colonel and his people were the first to arrive; he and his wife being so effusively grateful that they made me very uncomfortable indeed; Lilian met me with downcast eyes, and the faintest possible blush, but she said nothing just then. Five minutes afterwards, when she and I were alone together in the conservatory, where I had brought her on pretence of showing a new begonia, she laid her hand on my sleeve and whispered, almost shyly, 'Mr. Weatherhead—Algernon! Can you ever forgive me for being so cruel and unjust to you?' And I replied that, upon the whole, I could. We were not in that conservatory long, but, before we left it, beautiful Lilian Roseblade had consented to make my life happy. When we re-entered the drawing-room, we found Frank Travers, who had been told the story of the recovery, and I observed his jaw fall as he glanced at our faces, and noted the triumphant smile which I have no doubt mine wore, and the tender dreamy look in Lilian's soft eyes. Poor Travers, I was sorry for him, although I was not fond of him. Travers was a good type of the rising young Common Law barrister; tall, not bad-looking, with keen dark eyes, black whiskers, and the mobile forensic mouth, which can express every shade of feeling, from deferential assent to cynical incredulity; possessed, too, of an endless flow of conversation that was decidedly agreeable, if a trifle too laboriously so, he had been a dangerous rival. But all that was over now—he saw it himself at once, and during dinner sank into dismal silence, gazing pathetically at Lilian, and sighing almost obtrusively between the courses. His stream of small talk seemed to have been cut off at the main. I saw by Travers's face that he was telling himself he would have found fifty Bingos in half the time—if he had only thought of it; he smiled a melancholy assent to all the Colonel said, and then began to study me with an obviously depreciatory air. I troubled the Colonel to pass the claret; Travers laughed for the first time. 'That's a good idea,' he said, in that carrying 'bar-mess' voice of his; 'an air-gun for cats, ha, ha! Make good bags, eh, Weatherhead?' I said that I did, very good bags, and felt I was getting painfully red in the face. 'If you really won't take any more wine,' I said hurriedly, addressing the Colonel and Travers, 'suppose we all go out and have our coffee on the lawn? It—it will be cooler there.' For it was getting very hot indoors, I thought. To my unutterable horror I saw that that miserable poodle, after begging unnoticed at the teatable for some time, had retired to an open space before it, where he was now industriously standing on his head. They seemed disposed to accept this solution, and indeed I believe they would have credited Bingo with every conceivable degree of sensibility; but I felt myself that if this unhappy animal had many more of these accomplishments I was undone, for the original Bingo had never been a dog of parts. My heart almost stopped with terror—I had altogether forgotten that. I hastened to set the point at rest. 'Oh, it was the left,' I said positively; 'I know it because I remember so particularly thinking how odd it was that it should be the left ear, and not the right!' I told myself this should be positively my last lie. 'Why odd?' asked Frank Travers, with his most offensive Socratic manner. I could not very well refuse; I sat down and told the story, all my own way. I painted Blagg, perhaps, rather bigger and blacker than life, and described an exciting scene, in which I recognised Bingo by his collar in the streets, and claimed and bore him off then and there in spite of all opposition. I had the inexpressible pleasure of seeing Travers grinding his teeth with envy as I went on, and feeling Lilian's soft, slender hand glide silently into mine as I told my tale in the twilight. There certainly was a swarthy man there, and, though I had no reason for it then, somehow my heart died within me at the sight of him. I felt I must deal with this person alone, for I feared the worst; and, asking them to excuse me, I went to the hedge and faced the Frenchman with the frightful calm of despair. He was a short, stout little man, with blue cheeks, sparkling black eyes, and a vivacious walnut-coloured countenance; he wore a short black alpaca coat, and a large white cravat with an immense oval malachite brooch in the centre of it, which I mention because I found myself staring mechanically at it during the interview. 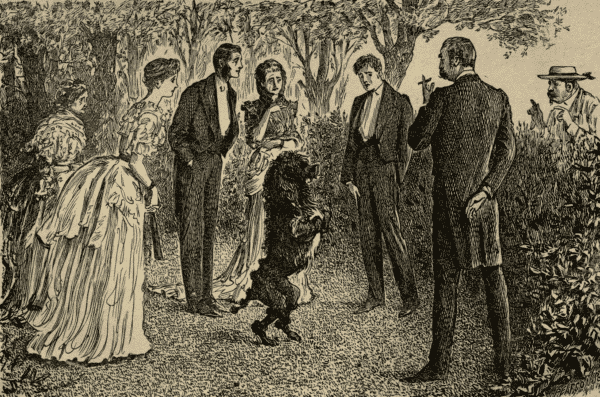 'I tell you,' I said, 'that poodle belongs to the gentleman over there.' And I pointed to the Colonel, seeing that it was best now to bring him into the affair without delay. 'You are wrong,' he said doggedly; 'ze poodle is my poodle! And I was direct to you—it is your name on ze carte!' And he presented me with that fatal card which I had been foolish enough to give to Blagg as a proof of my identity. I saw it all now; the old villain had betrayed me, and to earn a double reward had put the real owner on my track. I decided to call the Colonel at once, and attempt to brazen it out with the help of his sincere belief in the dog. 'Eh, what's that; what's it all about?' said the Colonel, bustling up, followed at intervals by the others. But the brute ignored him altogether, and began to leap wildly at the hedge, in frantic efforts to join the Frenchman. It needed no Solomon to decide his ownership! 'You are not convince? You shall see more. Azor, ici! Pour Beesmarck, Azor!' (the poodle barked ferociously). 'Pour Gambetta!' (he wagged his tail and began to leap with joy). 'Meurs pour la Patrie! '—and the too-accomplished animal rolled over as if killed in battle! 'Where could Bingo have picked up so much French!' cried Lilian, incredulously. 'Or so much French history?' added that serpent Travers. 'Shall I command 'im to jomp, or reverse 'imself?' inquired the obliging Frenchman. I tried a last desperate stroke. 'Will you come round to the front?' I said to the Frenchman; 'I'll let you in, and we can discuss the matter quietly.' Then, as we walked back together, I asked him eagerly what he would take to abandon his claims and let the Colonel think the poodle was his after all. 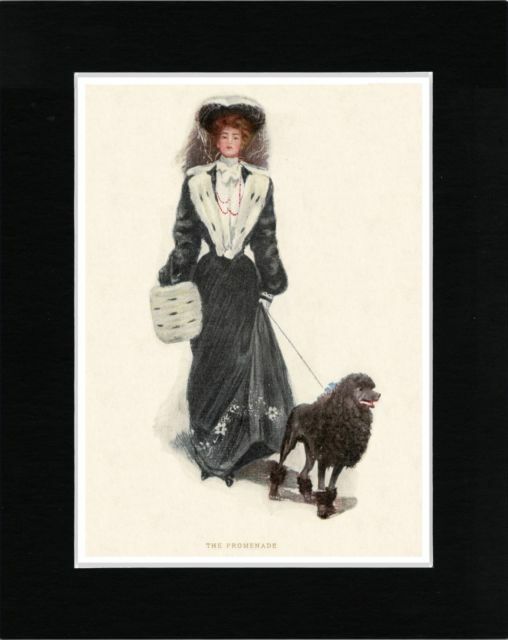 He was furious—he considered himself insulted; with great emotion he informed me that the dog was the pride of his life (it seems to be the mission of black poodles to serve as domestic comforts of this priceless kind! ), that he would not part with him for twice his weight in gold. 'Why, Weatherhead, have you lost faith too, then?' said the Colonel. 'What do you think, Travers?' asked the Colonel. And Lilian and her aunt both protested that they had had their doubts from the first. 'Zen you pairmeet zat I remove 'im?' said the Frenchman. 'Certainly' said the Colonel; and after some apologies on our part for the mistake, he went off in triumph, with the detestable poodle frisking after him. It was Bingo's collar. Travers took it from his hand and brought it to us. 'This was on the dog when you stopped that fellow, didn't you say?' he asked me. It was the sort of thing I did not enjoy at all. 'You must excuse me to-night, Travers,' I said uncomfortably; 'you see, just now it's rather a sore subject for me—and I'm not feeling very well!' I was grateful just then for a reassuring glance of pity and confidence from Lilian's sweet eyes, which revived my drooping spirits for the moment. I assured him that it was of no consequence. 'Perhaps,' he replied, looking steadily at me through his keen half-shut eyes, 'you vill not say zat ven you regard ze 'ole. And you others, I spik to you: somtimes von loses a somzing vich is qvite near all ze time. It is ver droll, eh? my vord, ha, ha, ha!' And he ambled off, with an aggressively fiendish laugh that chilled my blood. 'What the dooce did he mean by that, eh?' said the Colonel, blankly. But before that I had contrived to draw near it myself, in deadly fear lest the Frenchman's last words had contained some innuendo which I had not understood. It was light enough still for me to see something, at the unexpected horror of which I very nearly fainted. That thrice accursed poodle which I had been insane enough to attempt to foist upon the Colonel must, it seems, have buried his supper the night before very near the spot in which I had laid Bingo, and in his attempts to exhume his bone had brought the remains of my victim to the surface! There the corpse lay, on the very top of the excavations. Time had not, of course, improved its appearance, which was ghastly in the extreme, but still plainly recognisable by the eye of affection. 'Except one Algernon Weatherhead, Esq., eh?' whispered Travers jocosely in my ear. There was a terrible explosion after that; they saw at last how I had deceived them, and put the very worst construction upon everything. Even now I writhe impotently at times, and my cheeks smart and tingle with humiliation, as I recall that scene—the Colonel's very plain speaking, Lilian's passionate reproaches and contempt, and her aunt's speechless prostration of disappointment. I made no attempt to defend myself; I was not perhaps the complete villain they deemed me, but I felt dully that no doubt it all served me perfectly right. Still I do not think I am under any obligation to put their remarks down in black and white here. Travers had vanished at the first opportunity—whether out of delicacy, or the fear of breaking out into unseasonable mirth, I cannot say; and shortly afterwards the others came to where I sat silent with bowed head, and bade me a stern and final farewell. And then, as the last gleam of Lilian's white dress vanished down the garden path, I laid my head down on the table amongst the coffee-cups and cried like a beaten child. If this explanation of mine ever reaches my neighbours' eyes, I humbly hope they will have the humanity either to take away or tone down that tablet. They cannot conceive what I suffer, when curious visitors insist, as they do every day, in spelling out the words from our windows, and asking me countless questions about them! Sometimes I meet the Curries about the village, and, as they pass me with averted heads, I feel myself growing crimson. Travers is almost always with Lilian now. He has given her a dog—a fox-terrier—and they take ostentatiously elaborate precautions to keep it out of my garden.